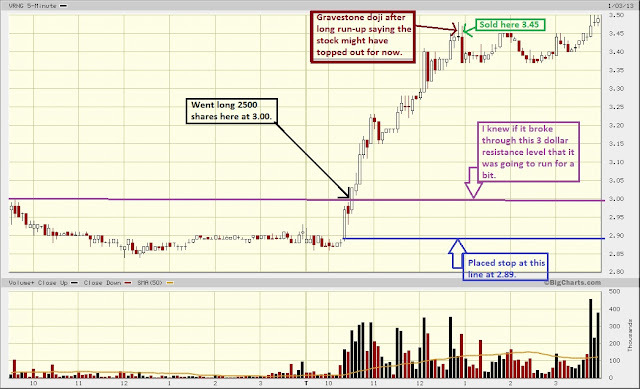 This trade on VRNG today was pretty easy based on pure instinct. I have been watching/trading VRNG stock every day for about 9 months now, and know the ins and outs of it without looking at a chart. There is a picture snap of my tweet below before I bought it. Went long 2500 shares at 3.00, and sold it at 3.45 when a gravestone doji formed, that pretty much told me this upward breakout might be over for today. But, the day wasn’t all that great though because a small percentage of my capital is stuck in LPH when I was trying to catch the bounce during the sell-off. Nice trade on VRNG. How many shares did you have in LPH? Thanks about VRNG. I had bought 5000 shares of LPH at .50 cents. Then 8 minutes later it got halted.